Gluten-free buckwheat crêpes are a nutritious alternative to crepes made with refined flours. Earthy and slightly nutty in taste, they are a delicious and healthy way to start the day. 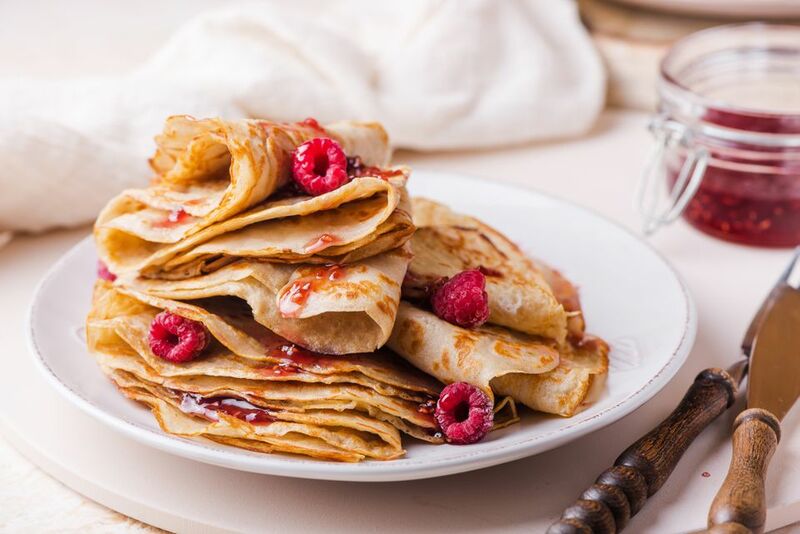 Serve these heavenly crêpes warm with berry jam or delicious crepe fillings. Note: while there are multiple steps to this recipe, these gluten-free buckwheat crêpes are broken down into workable categories to help you better plan for preparation and cooking. Pour milk, eggs, and melted butter or olive oil into a blender pitcher. Pulse just until combined. In a small bowl, mix gluten-free buckwheat flour, gluten-free all-purpose flour mix, and salt. Add to liquid in blender and pulse just until combined and smooth. Allow batter to rest for 2 hours. This gives the flour time to absorb the liquids in the recipe. Heat a low-sided 8-inch skillet or crêpe pan over medium-high heat. Pour 1/4 cup of batter into the heated skillet. Swirl the skillet until the bottom of the pan is covered with batter. Cook the crêpe for about 1 minute. The crepe should be barely moist on top. Use a thin spatula to loosen the edges of the crêpe, slide the spatula under the crêpe and gently flip it upside down. Cook for another minute, just until lightly browned and transfer crêpe to a cooling rack or plate. Serve with filling and enjoy! The batter can be made a day ahead of time and refrigerated for convenience. Use your favorite packaged all-purpose gluten-free flour mix in this recipe or make your own gluten-free flour mix.